To Cite: Latif Moini A, Farbod Ara T, Abadi F. Primary Pulmonary Lymphoma and Cutaneous Metastasis: A Case Report, Iran J Radiol. 2014 ; 11(3):e15574. doi: 10.5812/iranjradiol.15574. Diffuse large B cell lymphoma is the most common type of non-Hodgkin's lymphoma, representing nearly one-third of all cases. Any organ can be involved, making a diagnostic biopsy imperative. When the lungs are the involved organs, it is called primary pulmonary lymphoma (PPL). Hereby, we present a case of primary pulmonary lymphoma (PPL) that demonstrated a single large mass on chest CT and had metastatic skin lesions. The diagnosis of PPL was performed by histopathology and immunohistochemistry staining of the transthoracic lung biopsy and skin lesion specimens. 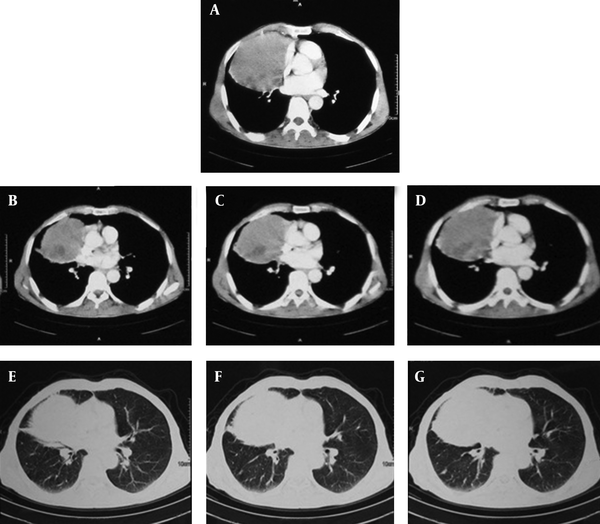 This case highlighted an unusual and subtle clinical presentation, and the importance of new onset pulmonary symptoms and a large lung mass on chest X-ray. Review of the literature on the patient`s radiographic presentation revealed various findings, the most common of which were single or multiple nodular lesions in one or two lungs. It highlighted the fact that this diagnosis should be considered in all cases with a lung mass and skin lesions. Diffuse large B cell lymphoma is the most common type of non-Hodgkin's lymphoma, representing nearly one-third of all cases. This lymphoma makes up the majority of cases in previous clinical trials of "aggressive" or "intermediate-grade" lymphoma. (1-3). Diffuse large B cell lymphoma can be present at extranodal sites. Over 50% of the patients will have some site of extranodal involvement at diagnosis, with the most common sites being the gastrointestinal tract and bone marrow, each being involved in 15-20% of the patients. Any organ can be essentially involved, making a diagnostic biopsy imperative (3). Lungs could be one of these involved organs; in this case, it is called primary pulmonary lymphoma (PPL). The definition of the disease should be clarified. L’Hoste et al. introduced PPL as clonal lymphoid proliferation of one or both lungs (parenchyma or bronchi, or both) with no demonstrable extrapulmonary involvement at the time of diagnosis or during the following three months (4). We present a case of PPL with a single large mass on chest CT and metastatic skin lesions. The diagnosis of PPL was performed by histopathology and immunohistochemistry staining of the transthoracic lung biopsy and skin lesion specimens. The presented case is a 70-year-old male smoker. The patient came to the internal medicine clinic because of shortness of breath, dry cough, and a 10-kilogram weight loss and skin lesions. His pulmonary symptoms had appeared since 4 months ago, and during the last recent month, the cutaneous lesions had abruptly appeared and the dyspnea had worsened afterwards. In examination, he was pale and bilateral symmetric wheezing was heard on his lungs. Lymphadenopathy was not detected anywhere. Generally, he had cutaneous lesions located on the anterior chest, abdomen (Figure 1) and palpebra. There were diffuse macular lesions on the chest and some were formed as subcutaneous nodules. The single pigmented nodule was seen on the superior right palpebra. The dermatologist proposed that these might be mycosis fungoides, cutaneous lymphoma, metastatic carcinoma, sarcoidosis or lepromatous leprosy. On chest X-ray, a single large mass on the right middle lobe was seen (Figure 2). In addition, spiral computed tomographic scan (Siemens’ Emotion 6 slice, Germany) of the chest showed a single well-defined large mass on the right lung (10×11 cm), it was heterogeneous and located in the right middle lobe without any fat or calcification. There was no pleural effusion. 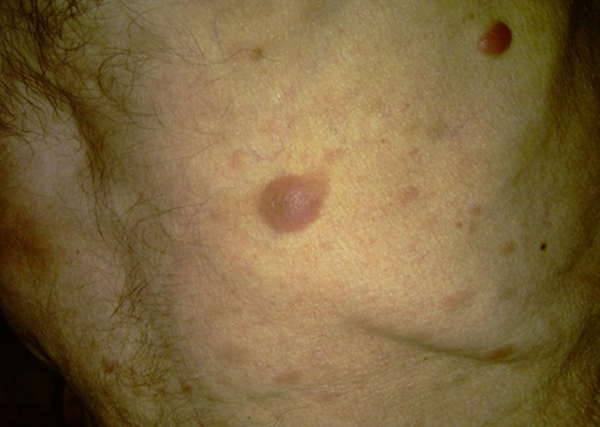 No lymphadenopathy was seen in both hila. The lesion did not invade the ribs or the diaphragm (Figure 3). Initial laboratory findings showed abnormal complete blood cell counts (white blood cell count 2800/ml; 27% lymphoid cells, 72% neutrophils and 1% monocytes, hemoglobin 10mg/dl; and a platelet count of 221000); C reactive protein (CRP) of 1+, erythrocyte sedimentation rate, 56; LDH of 593 U/liter and a normal iron profile. The bronchoscopic examination did not show any endobronchial lesions, bronchoalveolar lavage (BAL) showed an increase in lymphocytes and mycobacterium tuberculosis and malignant cells were negative. A transthoracic lung biopsy was carried out and histopathologic evaluation revealed a diffuse skin tissue infiltration by medium and large sized tumoral cells (˟ 40) in the deep dermis (Figure 4). The epidermis and upper dermis were free (˟ 10) of tumoral cells but the perineural invasion of them was observed. They had large nuclei with small nucleoli and an indistinct cytoplasm (˟ 40). So, lung biopsy was carried out and it showed diffuse infiltration of medium to large sized lymphoid cells. Immunohistochemistry (IHC) staining of the lung and skin were done for cytokeratins (CK), CD 20, CD 10, CD 5 and CD 3. IHC staining of skin biopsy for CK indicated panCK negative for tumoral cells. Remnants of the sweat glands were positive and all tumoral cells were diffusely positive for CD 20 that remained on membrane of cells. All tumoral cells for CD 5, CD 10 and also scattered pattern were negative for CD 3 among lymphoma cells. Lung biopsy was stained for CK, so that remnants of mucosal glands were positive, but background tumoral cells showed panCK negative. Overall, IHC staining of lung biopsy for CD 20 revealed strong presence of tumoral cells. The features suggested diffuse large B-cell lymphoma of the lung that had metastasis to the skin. Bone marrow biopsy, abdominal, neck, and brain CT scan and upper esophagogastric endoscopy were done and all were normal. These documentations and their sequences of symptoms indicated primary pulmonary lymphoma. The patient received chemotherapy and improved in two months, but during this period he died of sepsis. Figure 3. Chest computed tomographic (CT) scan in the mediastinal and parenchyma views revealed a single large mass (10×11 cm) in the right middle lobe without any lymphadenopathy in the bilateral hila. Vascular markings and intersepta are normal. Figure 4. Skin biopsy. A, Diffuse infiltration of medium to large sized lymphoid cells with invasion to the perineural space was revealed. Nuclei of the tumor cells are distinctive.B, IHC staining of the biopsy for CD 20. The membrane of tumoral cells are strongly stained and disclose B-cell origin. This is a case of primary pulmonary diffuse large B-cell lymphoma (DLBCL) that showed a single large mass in the right lung with diffuse cutaneous metastasis. PPL is a presentation of less than 1% of lung cancers, and less than 1% of malignant lymphomas (5). The most common primary lymphoma of the lung is low-grade mucosa associated lymphoid tissue MALT lymphoma arising from the bronchus and the second is diffuse large B-cell lymphoma (6). Differential diagnoses of a single pulmonary mass are bronchogenic carcinoma, lung metastasis, mycobacterial infection, fungal pneumonia, lung abscess, pulmonary pseudotumor, atelectasis and rarely pulmonary arteriovascular malformation, hematoma, bronchogenic cyst, pulmonary sequestration, pericardial cyst and hydatid cyst. The most common presentation of PPL is minor non-speciﬁc symptoms, such as persistent cough, or maybe asymptomatic in up to one half of the cases (7). 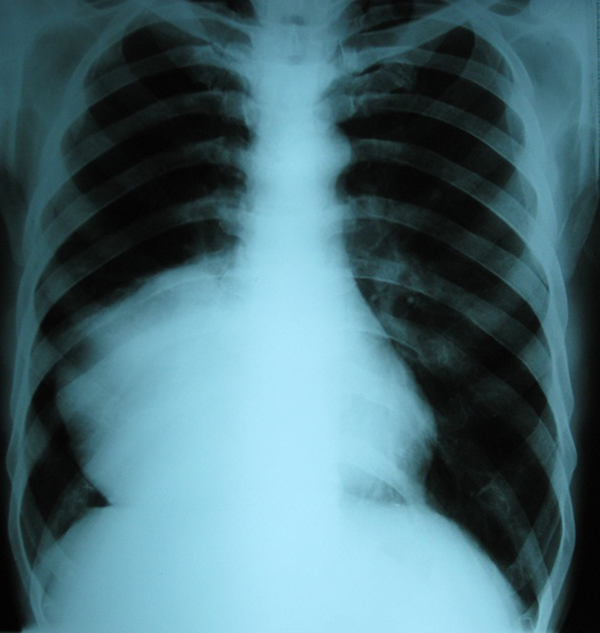 Radiographic findings of PPL are not specific, but the typical presentations are single or multiple nodular shadows that may involve one or both lungs, these well-defined infiltrations frequently have air-bronchograms (5, 8, 9), and the nodal involvement in about 30% of the cases is detectable (9). Less than 10% of the patients have bilateral diffuse ill-defined infiltrations along the bronchovascular pattern and interlobular septa, which have reticulonodular opacities, and atelectasis or pleural effusion are rarely seen (10, 11). CT scan can have valuable data of hilar and mediastinal lymphadenopathies in all cases (11). In evaluation of radiological findings of 24 PPL patients, Jung et al. showed that 29.2% of the patients had single or multiple nodules, mass or masses in 16.7%, infiltrates in 41.7% and consolidation in 20.8%. Hilar lymphadenopathy was found in five patients and a direct chest wall invasion was seen in one (6). So we can argue that PPL can be considered as a rare differential diagnosis of these radiological presentations, but tissue biopsy is needed to determine it. In the evaluation of 12 pulmonary involvement of MALT lymphoma in a study conducted by Zinzani et al., it has been shown that 66.7% of the patients required surgical procedures including open thoracotomy or video assisted thoracic surgery (VATS) to establish the definitive diagnosis. Bronchoscopy in 83% revealed the disease, but trans bronchial lung biopsy (TBLB) was useful only in 30% of the patients. This study mentions that only a few studies suggested a flowcytometry of BAL may be helpful in diagnosing pulmonary lymphoma (12). In our case, immunohistochemical study of the lung and skin biopsy demonstrated diffuse large B-cell lymphoma by a large lung mass in the chest X-ray. Chest CT that did not show involvement of any other organs and it determined PPL with cutaneous metastasis. The most common tumor that had cutaneous metastasis in males is lung cancer with an incidence of 2.8-7.5% (13). The anterior trunk, head and neck regions are the most common sites of metastasis that related to lung malignancies, but they may appear anywhere in the body. Cutaneous metastasis is a sign of an aggressive, poorly differentiated, malignant tumor and they are not likely to be cured (14). In this case, differentiation of the metastatic cutaneous lesions from primary skin lymphoma was only possible by the sequence of symptoms and the large lung mass. So, the immunohistopathologic study of tissue biopsies, lung biopsies and no involvement of other sites encouraged us to the diagnosis of primary pulmonary lymphoma. We suggest considering PPL as a rare, but possible diagnosis in patients with cutaneous metastasis or a large lung mass.